Digital marketing is an umbrella term for the targeted, measurable, and interactive marketing of products or services using digital technologies to reach and convert leads into customers. The key objective is to promote brands, build preference and increase sales through various digital marketing techniques. It is embodied by an extensive selection of service, product and brand marketing tactics, which mainly use the Internet as a core promotional medium, in addition to mobile and traditional TV and radio. 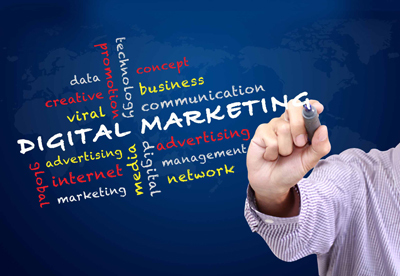 Digital marketing activities are search engine optimization (SEO), search engine marketing (SEM) , content marketing, influencer marketing, content automation, campaign marketing, and e-commerce marketing, social media marketing, e-mail direct marketing, display advertising, e–books and a few others. Since marketing is about influencing people who might buy your product or service, using messaging that conveys value, it can be achieved through approaching the target audience which apparently has two procedural gateways. Old school marketing used traditional channels such as broadcast radio and tv and print to communicate with the target market. With the emergence of internet and e-social networks, people spend significant amount of their time online and hence present a large population worth targeting. New school marketers have kept the traditional methods that still work, and have combined them with digital technology to communicate with consumers on a different and deeper level. New school marketing relies heavily and mostly on such Internet channels as Web sites, blogs and social networks. Old school marketing put prospecting at the widest part of the funnel. The first priority was to find as many consumers as possible, convert some of them into customers, and establish a relationship with a few of those customers to earn their loyalty. In his book, “Flip the Funnel,” author Joseph Jaffe acknowledges a basic tenet of new school marketing: there is high value in cultivating a loyal customer base and keeping it engaged with continued communications. Finding customers now occupies the narrowest part of the funnel — not because finding customers is less important than it was, but because the loyal customers now fill part of that role. Old school marketers were off the hook once consumers made the decision to buy. New school marketers devote significant resources to maintaining relationships with those loyal customers.